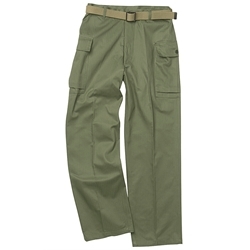 U.S. GI HBT Fatigue Pants. WWII U.S. GI Herringbone Twill Fatigue Uniform. In May 1941, the War Department announced the introduction of the new green herringbone twill (HBT) uniform. The two-piece HBT fatigues were also worn as the summer tropical combat dress. Impregnated with an anti-vesicant compound, it was issued for use in the D-Day Normandy landings. Our HBT reproduction is made like the original from 100% cotton twill without the anti-vesicant. Sizes 32 inch hemmed inseam.